As the Great Recession continues to unfold, policymakers have called for countries to pursue fiscal stimulus plans in order to offset the contraction in private demand. Yet not all countries are capable of enacting these interventions—even small ones—because of the nature of their economies. This is particularly true in Latin America and the Caribbean (LAC). In the following article, we discuss the current status of the LAC countries in terms of the magnitude of the fiscal stimulus efforts already underway. Recent data on export growth, industrial production and consumer confidence in Latin America is forcing major revisions in the growth outlook for the region. Last January the consensus forecast was close to 1 percent GDP growth for 2009. Today, it is close to zero. There are, however, some important differences within economies in the region. Mexico is expected to experience the largest contraction, given its greater interdependence with the U.S. A contraction is also expected in Argentina and Venezuela, which are facing the effects of lower commodity prices combined with lack of confidence by private investors, both at home and abroad. Ecuador, which has already defaulted, is expected to join the club of contracting economies. In contrast, oil and mining growth continue to stimulate the economy in Peru, which is the only large country that will expand by more than 4 percent this year. To offset the external shock of the global financial crisis, most central banks in LAC are actively using monetary policy, which has been helped by declining inflation. Countries that follow inflation targeting are rapidly cutting interest rates. Brazil recently reduced its benchmark interest rate by 150 basis points, the steepest cut in five years, and Chile slashed its rate by 500 basis points in the past two months, the sharpest reduction in the last 15 years. As a result, credit to the private sector is still expanding in Brazil, Chile, and Colombia. However, monetary policy alone will not bring macroeconomic stability. As elsewhere, governments are aware of the need to use more active fiscal policy, especially following the IMF’s call for countries to put in place fiscal stimulus of around 2 percent of aggregate GDP each year for 2009-2010, depending on the specific needs and circumstances of each country. In many Latin American countries it is not easy to reach that benchmark for two main reasons. First, the collapse in export prices and volumes has a direct and large impact on public finances. 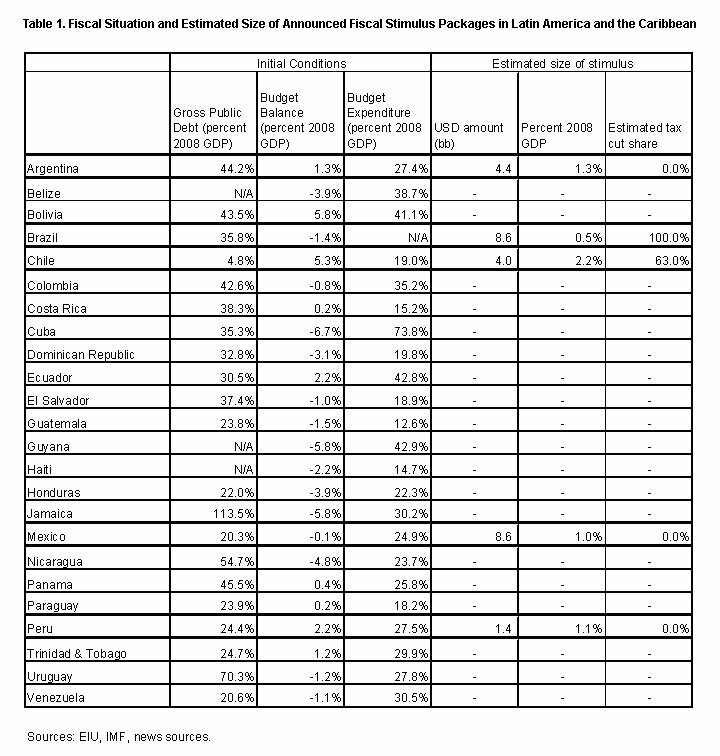 The IMF estimated that a 35 percent decline in commodity prices, like the one observed from a year ago, would cause a reduction in fiscal revenue (in terms of GDP) of about 7 percent in Trinidad and Tobago, 6 percent in Venezuela, 4 percent in Ecuador and Bolivia, 3 percent in Mexico and Chile, and 1.5 percent in Peru and Argentina. This effect, combined with the reduction in general tax revenues, is exerting pressure on borrowing requirements, even before any consideration is made about a discretionary fiscal stimulus. Second, in some cases, government debt is already over 50 percent of GDP, a sign of sustainability problems. (Although a detailed suitability assessment needs to consider other factors such as economic growth and the debt’s structure.) As shown in Table 1, many countries are in the 40 to 50 percent range, suggesting caution. In those cases where public debt is under 40 percent of GDP, the real question is whether additional financing is available. This is a serious concern for countries that depend entirely on development banks. This explains the differential fiscal responses in the region. The larger economies, with lower debt-to-GDP ratios and greater access to private capital flows, have announced fiscal plans to counteract the effects of the crisis. These include Argentina, Brazil, Chile, Mexico and Peru. As shown in Table 1, the range of fiscal measures and instruments vary. Brazil: This is a good example of a country where the focus has been on tax cuts. The tax on financial transactions will be cut from 3 percent to 1.5 percent, while personal income tax rates were lowered to favor those who earn up to US$875 per month. The estimated cost of these measures is 0.5 percent of GDP. Additional investments were announced, but they rely on the private sector or will not take place anytime soon, like the high-speed train connecting Rio de Janeiro and São Paulo. Mexico: In an early announcement, the Mexican government decided to accelerate investments in infrastructure. Again much of it depends on the private sector, so the net effect is difficult to assess. Supplemental budget allocations have been announced for social programs, especially in the area of employment protection. The IMF has estimated that the total additional expenditures amount to 1 percent of GDP. Chile: This is the largest stimulus package in the region. On the revenue side, effective corporate and personal income tax rates were reduced, while the stamp duty was eliminated for 2009. A US$7 billion public investment budget was announced, including a 10 percent real increase in housing subsidies. In addition, the package includes an employment subsidy for low-wage young workers, as well as additional cash transfers to low income households. The cost is estimated at US$4 billion, or 2.2 percent of GDP, making it the largest fiscal stimulus package in Latin America. Argentina: Mainly through the forced nationalization of pension savings, the government has been able to finance a larger fiscal deficit. Export taxes have been lowered as well as employer’s social security contributions. On the expenditure side, an additional allocation for social programs was adopted, as well as a large public works plan worth US$4.4 billion, or 1.3 percent of GDP. However, given that the funding is entirely based on forced domestic savings many question its effectiveness from the demand point of view. Peru: The Peruvian program is based on a US$1.4 billion increase in public investment in 2009 (1.1 percent of GDP), mostly for roads, housing and hospitals. The program also includes additional incentives for non-traditional exports and an increase in social programs with an estimated cost of 0.15 percent of GDP. All in all, the total effective stimulus in five of the seven largest economies in the region is estimated to amount to USD 27 billion, or 0.8 percent of their combined GDP. This might not be enough to offset the effects of the crisis. But likely sets a realistic cap on what can be done for other countries in the region. Few countries could do more without wearing down confidence in their ability to pay their debt.